The Kaplan Institute will attract innovative and entrepreneurial students from across the campus (and beyond) who will come to learn how to convert their creative ideas into significant and viable businesses, services, and new solutions. They will become the leaders, inventors, and entrepreneurs of the future discovering, addressing, and solving serious and consequential problems. New faculty, donors, sponsors, and other business and industry partners will also be attracted to the new initiative and the abundant opportunities which it will provide for all. The Kaplan Institute will nurture the advancement of critical and creative ideas, foster interdisciplinary and external collaboration, and create a culture that enables innovation and tech entrepreneurship to flourish on campus and throughout the larger community as well. In addition, the institute will aggressively contribute to its surroundings and to Chicago’s overall economy by encouraging, supporting, and assisting its students and faculty in creating new businesses and other entrepreneurial endeavors. The emphasis of the educational experience within the institute (once the students have completed some of the basic introductory programs) will be on the application of knowledge rather than merely its acquisition. Additional and essential learning will, of course, occur during the entrepreneurial process along with innovative thinking as the students engage in multidisciplinary collaborations across all of the disciplines offered within the broader context of the entire university. In fact, part of the entire purpose of the KI is to supplement the technical education of the students with critical and future-proof skills including intellectual curiosity, a commitment to change, team-building ability, an entrepreneurial mindset, a willingness to accept challenges, and a bias toward action. Special leadership programs will be developed and offered to identified cohorts of undergraduates as well as graduate students, focusing on the development critical-thinking skills, resilience and perseverance, adaptability and agility, and strategic design and planning. The design of the Kaplan Institute features technologically advanced building materials and systems and adds a dramatic new presence to the university’s iconic campus designed by Ludwig Mies van der Rohe. 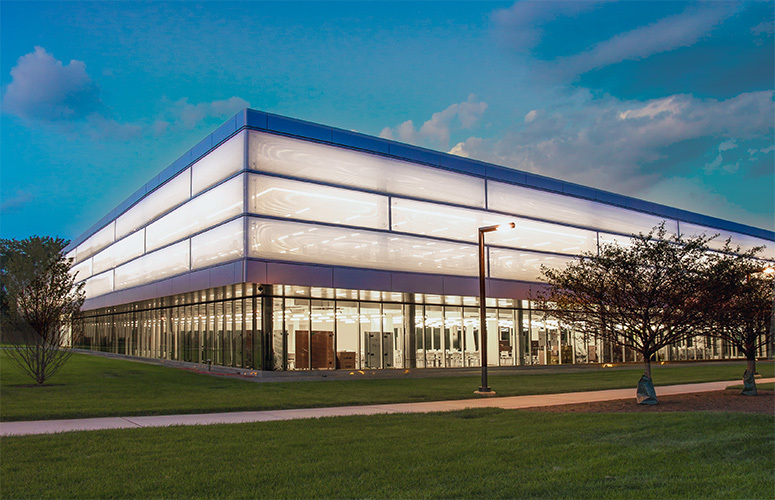 The building provides flexibly adaptable teaching space for Illinois Tech’s project-based, interdisciplinary courses. 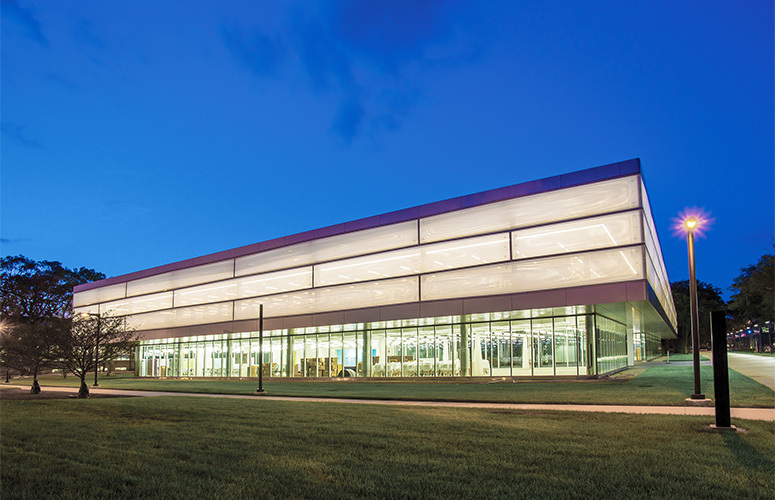 “The design for the Kaplan Institute is a thoughtful and sensitive contribution to Illinois Tech’s important architectural legacy yet is forward looking in its approach to the flexible and technologically advanced learning facilities needed today,” says John Ronan, Illinois Tech professor of architecture and architect for the project. According to Ronan, the design is also innovative in its own right, especially in its approach to sustainability. The second floor of the LEED Gold-designated building, which cantilevers over the ground floor to provide sun shading, is enclosed in a dynamic façade of ETFE (Ethylene Tetrafluoroethylene) foil cushions, the first use of its kind in Chicago. The dynamic ETFE façade can vary the amount of solar energy entering the building through sophisticated pneumatics, and at one percent the weight of glass gives the building a light, cloud-like appearance. Building systems are similarly advanced. Water-filled tubing embedded in a concrete-filled metal deck converts the building’s floor structure into a radiant heating and cooling system. The building’s location is intentional and designed to draw students and faculty in from all directions. The horizontal, open, and light-filled building is similarly designed to encourage encounters between students and faculty across disciplines. Conceived as a hybrid of campus space and building, the innovation center is organized around two open-air courtyards through which visitors enter the building—and “collision nodes,” which will encourage chance meetings and information exchange across departments and disciplines. The courtyards serve as the building’s “eyes” and “lungs,” bringing in natural light and ventilation to create a comfortable and healthy interior environment for collaboration—and a continuous connection with nature. Circulation inside the building is indirect and dispersed, designed again to promote collaboration and interaction. 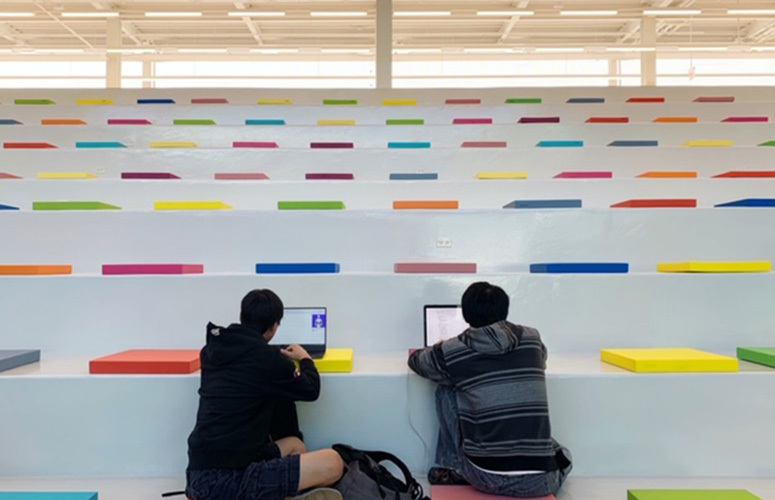 Large, open, horizontal floor plates allow visual connection to multiple spaces at one time while openings in the floor plate allow visual access from floor to floor to foster the feeling of a single collaborative community of users.